Inktober (or, well, October) is the month during which, every year, I finally fill my sketchbooks. I often neglect sketches in daily life. Of course, I draw every day. It's just rarely for "just" a sketch. Most of my drawings have an end product of sorts in mind, be it a commission piece, new Etsy stickers or prints. And what would be better as a subject than my trip to Thailand a couple months ago? This post contains affiliate links, which means that if you use one of the product links to shop, I’ll receive a small commission. None of the products are sponsored. You can check out my disclaimer here. Inktober, as the name implies, focuses on ink drawings, so I started with just a pencil and a pen. The stone textures and intermingled sparse trees made for great subjects. When sketching with photographic references, I usually don't copy a specific image, but toss several elements together. This means that I get to play with perspective and composition, while still having the reference material to capture the unique and unfamiliar architecture. Not using any pictures as reference and instead drawing straight from memory seems to create a more washed-out vision of the real thing, since my hand defaults to sketching forms and patterns I'm familiar with instead of the specific, in this case Thai, scenery. 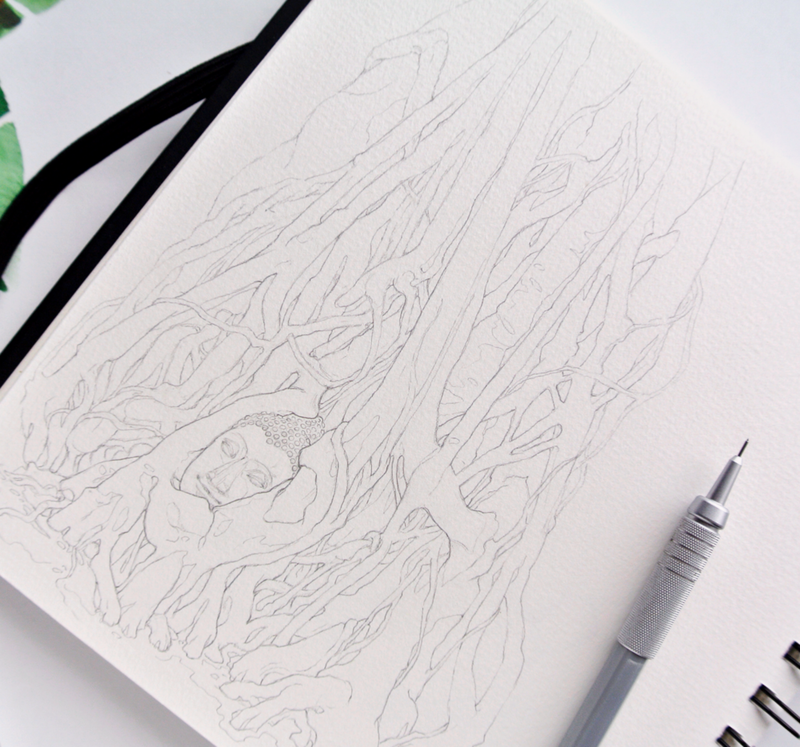 I use a Muji Mechanical Pencil in 0.3 for first rough outlines - this pencil is especially travel friendly since it's so sturdy! This picture was one of the reference pieces I used for the sketch above. You can recognize the individual buildings, but I switched their order and composition. The Buddha statue head in a tree at Wat Mahathat is famous, isn't it? Living in Korea, I learned that it's disrespectful to take pictures of the Buddha from above or at eye level. To capture that, I drew the tree with the statue's head embedded among its roots as if looking at it while lying on the ground. So many statues! It's quite the challenge to capture facial expressions cast in stone (and old and weathered...) but I like how this one turned out. In this sketch, too, I kept the eye level of the observer below the Buddha statue itself. The tree wasn't really that big but the leaf textures were too much fun to stop! One of my favorite pieces. This headless, hand-less and, fascinatingly, arm-less statue was hidden among more imposing ruins, and I nearly didn't take a picture of it. Luckily, I at least had a snapshot on my phone that later served as reference for this pencil drawing combined with watercolors by the Korean brand Shinhan. There's also this sense of sadness at the loss of a once great city, and all the historical events that lead to its ransacking and destruction. I tried to capture both the grandeur and the tragedy that make Ayutthaya so much more than just a tourist attraction. Inktober isn't over yet and I'll post more sketches soon! I started working with watercolors about half-way through the month, and also added landscape sketches of Jeju Island for variety. As for something more in my "usual" style for Etsy, I've finally finished painting and editing my Thailand stickers. While the printable files aren't yet available on Etsy (that will take me one or two days... my PC is still a mess...) I'll make the US letter size version temporarily available here. These should be great for travel diaries! Are you participating in Inktober? How is it going? I'd love to see more blogs showing their Inktober journey!